Machine wash. Sleeve 40'. Care Instructions. Length 35'. 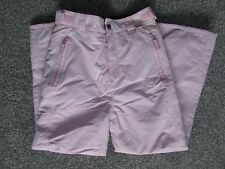 White and pink ladies NO FEAR Ski trousers - UK size 12. There are a couple of marks on the bottom of the trousers at the back (photo 7). No scuffs on the bottom of the trouser hem. Ski Jacket 11-12 Yrs (No Fear) . Few small black marks on front ( see last pic) has under arm zip opening. Has detachable hood Condition is Used. Dispatched with Royal Mail2nd Class. 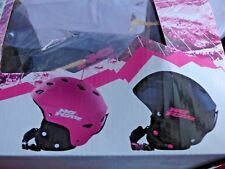 No Fear, Girls Black & Pink Waterproof Ski Gloves, Size XSG. These attractive gloves have a small pocket with zip detail on the back of each hand. Gloves are used although clean and in perfect condition. House is pet and smoke free. Dispatched with Royal Mail 2nd Class. NEW UNUSED NO FEAR BACK PROTECTOR SNOW BOARDING PROTECTION. High-Quality technical ski / snowboarding trousers. Waterproof, breathable with inner fleece lining. Been in storage since 2004. RRP £99.99. > Double snap fastening waistband. > Snap fastening ankle cuffs. > 2 zip pockets. > Machine washable. No Fear Waterproof Ski Gloves, size small. Items have never been worn outside, but have had the tags removed. But remain in new condition. Posted via 2nd class royal mail signed for. Please take a look at other listed items as combined postage is always given for more than one item won. 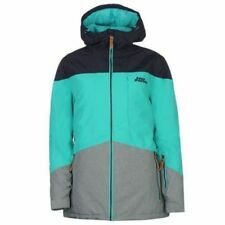 Women's No Fear ski/snowboarding coat. Size 10. Brand new with label still attached. Bought and never worn. RRP £114.99!! 3000mm waterproof and breathable, fully seam sealed. With ski pass pocket and adjustable hood. A Red ski jacket that has never been used. Black with pink logo and ankle trim. Side zipped pockets with zip and popper fastening. Size 13 but also suggested would fit a ladies size 8. No fear women’s black ski/snowboard trousers size 10. Condition is Used. Dispatched with Royal Mail 2nd Class. No fear womens black with grey/pink detail ski/snowboard trousers size 10 Waist 31” adjustable Length 28” Good used condition. No rips tears or scuffs. Condition is Used. Dispatched with Royal Mail 2nd Class. No Fear Mans Black Ski Jacket With Red Trim Size Small In Excellent Condition. ladies no fear ski trousers size 10 used but in good condition black . Condition is Used. Dispatched with Royal Mail 2nd Class. Grey and black with red details. Suitable to fit a teenager or small adult. 5 exterior zipped pockets (1 zip faulty). Thejacket is labelled size Small (Adult). Thetrousers are labelled large and are approx 32W/32L. White ski-boarding / skiing goggles by No Fear, NOFEAR. Pre-loved. JW - JW2019499 - NoFear Goggles. ● Carry bag. Colour White. Very light marking that does not interfere with vision what so ever. A good condition used pair of ski trousers. Size XL blue by No Fear 6 pockets.. 2 rear, 2 side, 2 leg 2 zips on inside of the legs Belt loops and adjustable velcro fastenings on the waist Zip and popper fastening Some of the decorative 'writing' is coming away but doesn't really detract from the condition. Haven't been worn a lot and have been freshly washed and line dried prior to sale. Please see pictures as they form part of the description I always keep postage receipts as proof of postage Any questions please ask! Thanks and happy bidding!! No fear ski Jackets, Ladies Size 10. Condition is Used. Dispatched with Royal Mail 2nd Class. NO FEAR Ski Jacket. Excellent condition. Not been worn much. 2 chest pockets, 2 waist pockets, 1 sleeve pocket. Size Small. No Fear Powder Ski Jacket Ladies RRP £115. This No Fear Powder Ski Jacket is great for keeping the cold out when on the slopes. > Toggle adjustable hem. > Ladies Ski Jacket. > 5,000mm Waterproof and breathability. Used No fear ski trousers. In good condition aged 9-10 years. Force Ski/Snowboard Pants. Mens Medium Black Primaloft insulation. “No Fear” Children’s Ski Jacket And Salopettes. Condition is Used although excellent condition. Black / Blue design suitable for male or female. Age 7-8. 3K waterproof, 3K breathable jacket with zip front fastening and Velcro, 3 internal pockets, 2 zipped and 1 Velcro with normal external pockets and lift pass pocket on the sleeve. Adjustable waist trousers with zip and popper x2 fastening and two front zipped pockets. No Fear Boost Ski Goggles. NEW EX DISPLAY. Brown lens with green Chroma coating. No Fear Purple and white snowboarding/ Ski Jacket. SKIING GLOVES. 10K BREATHABLE. - 10K Breathable. 10K WATERPROOF. - 10K Waterproof. POWDER SNOWBOARD. - Shell lining: 100% Polyester. - Lining: 100% Polyester. NoFear Velocity Skiing Snow Boarding Pants Trousers Black XXL BNWT. Condition is New with tags as seen in photos. Never worn, put in the draw and forgotten about. Need someone to use them!! Dispatched with Royal Mail 2nd Class. Payment via PayPal only within24 hours of auction ending. Item will be sent within 3 working days of payment clearing. Thank you. Good condition jacket. Photos describe the jacket. Zipped detachable hood. Lots of pockets. Away 17/03–28/03/19. SKI SNOWBOARD TROUSERS. IDEAL FOR THE SHORTER LEG LENGTH. INNER LEG CUFFS. NEW No Fear Snow Boarding Gloves. Black with blue piping - 100% Poly. No Fear Girls Ski-ing Snowboarding Trousers Age 9-10. Dispatched with Royal Mail 2nd Class. > Motocross pants. > Reinforced knee protection. > Breathable liner. Warm sturdy jacket in good condition. Womens Black Ski Trousers. Condition is Used. Dispatched with Royal Mail 2nd Class. mens ski jacket xl. No Fear.